Austin, TX ~ Ahead of the Jan. 8 kick-off to the 83rd Texas Legislature, Republican House of Representative members are being met with a challenge from grassroots activists statewide: “Conservative House Speaker Or Your Seat.” To reinforce the message that electing a significant margin of conservative House representatives signals voter expectations of conservative House leadership, WomenOnTheWall.org has released aTexas Speaker Showdown II – WE’RE BACK! video follow-up to the 2010 Speaker Showdown theme. The video notes 2012 Texas Tea Party electoral wins as well as current House Speaker Joe Straus’ loss of key political lieutenants following his obstruction of conservative legislation in the 2011 session. In addition to congratulating a great number of the newly-elected House members, it reminds that primary season 2014 offers the incoming 95 Republican representatives new “Fall of the RINOs” opportunity pending voter satisfaction with actions taken in the upcoming months. In supporting transparency for the House speakership vote, WomenOnTheWall.Org is calling on a floor vote not a caucus vote for Speaker so this first vote cast can alert conservative voters as to representatives potentially subject to 2014 primary election replacement. To “Keep Texas Strong,” issues supported by Republicans and Democrats must be debated as well as understood by the public. Simpson’s position is that floor votes for either party’s legislation should not be obstructed. If the speaker has exclusive power to control an overall legislative agenda, public policy passage becomes about who buys legislation – not a full, open review of policy options. WomenOnTheWall.Org believes state representatives deserve the opportunity to fully represent those who elected them as primary elections subsequently allow voters to hold accountable officials failing to serve constituents’ best interests – no matter which side of the political aisle they are on. A Simpson victory will require Republican and Democratic support. It will be a win for all Texas voters by offering greater accountability and for all House members by providing the power to represent their constituents as per the Texas Constitution. WomenOnTheWall.Org is a 501(c)(4) Texas non-profit corporation dedicated to protect our children from the many destructive forces within our nation. If you are ready to take a stand call your State Representative today ,Here is a list of them. 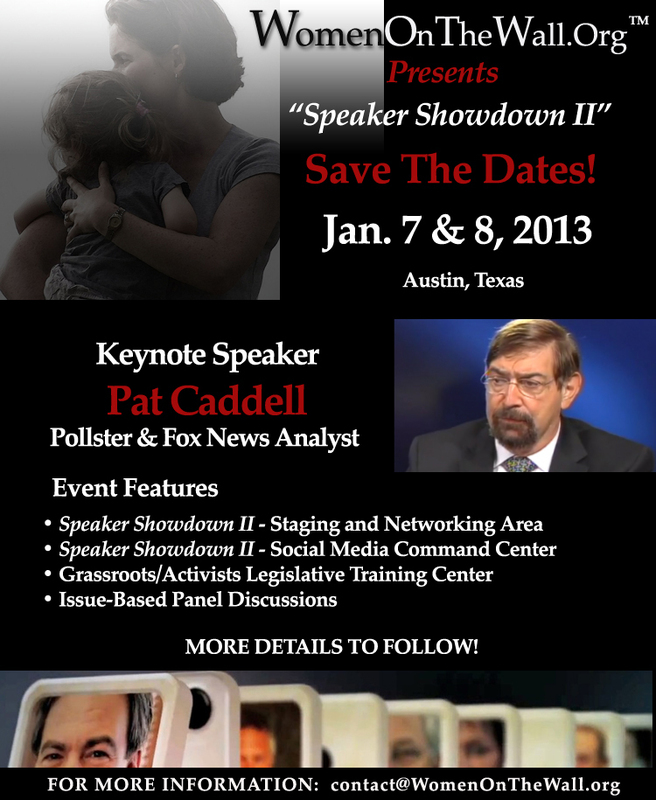 Tell them to vote for the most Conservative Candidate in the Race for Speaker;David Simpson and then join us in Austin Jan. 7th and 8th. If you are interested in stepping up and making a difference in Texas please donate to help us take the video linked above to the airways!